Glendale Truck Accident Injury Lawyer - Over 40 Years of Experience You Can Trust! Have You Been Injured in a Truck Accident or Car Accident in Glendale? Our Glendale truck accident injury attorneys and law firm provide outstanding personal injury legal services for people injured in truck collisions, which includes accidents involving 18 wheelers or big rigs, and for the families and relatives of those killed in truck and other fatal accidents for wrongful death claims in Glendale, a city located in Los Angeles County, California. If you or anyone you know was involved in a truck collision or other personal injury claim in Glendale, Los Angeles, Burbank or anywhere else in California, please contact our truck accident injury attorneys and law office now for a completely FREE CONSULTATION. Please visit our Truck Injury Accident Web Site to find out more helpful facts about truck accident injury claims and our law firm. Glendale, nicknamed "The Jewel City", is the third largest city in Los Angeles County, bordered by Sun Valley to the northwest, La Canada Flintridge to the northeast and Burbank to the west. Glendale has a population of 191,719 according to the 2010 U.S. Census. Tourists can visit the Americana at Brand, which is one of the several large outdoor shopping communities in Los Angeles County, featuring several terrific restaurants, including Frida Mexican Cuisine, and nearby Universal Studios, which is located close by in the community of Universal City. Glendale also is the location for the famous Forest Lawn Memorial Park, a private cemetery that contains notable burials such as Walt Disney and Michael Jackson, and Mt Sinai Cemetery. 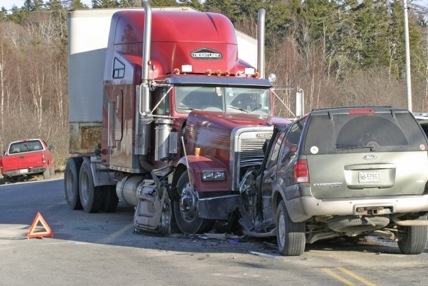 Victims of truck accidents face various injuries ranging from fractures to nerve damage. One of the most serious injuries a victim may obtain from a truck accident is brain damage or traumatic brain injury (TBI). The brain is the center of the nervous system and any trauma to the brain can cause permanent damage or even death. One of the common causes to brain damage is from a vehicle collision because of the sudden impact that leads to sudden acceleration or deceleration within the cranium, causing alterations in the cerebral blood flow and pressure within the skull. If you or a loved one have sustained a brain injury from any truck accident or other personal injury accident, please contact us now, including for referrals to doctors who may provide treatment without a request for payment until the claim is resolved, in Glendale, Burbank or anywhere in California. The Law Offices of Gary K. Walch, A Law Corp., provides you with the strong advocacy that you need when you or someone you care about has been through a tragic truck collision or other injury accident in Glendale or anywhere in California, and at the same time the compassion and understanding to make this process easier for you and your family. It is our task to best represent your interests and aggressively pursue your rights. Our staff handles accidents involving truck, car, bus, train, hit and run, pedestrian, uninsured motorist (UM), motorcycle, bicycle and much more. Email us: info@WalchLaw.com or click on our contact link to tell us about your case Remember, with our firm on truck & car accident injury cases We offer an absolutely FREE consultation and There is NO fee until you win!